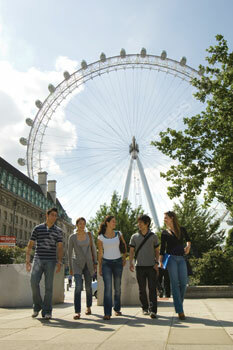 Enjoy an English course in London, a city unlike any other! England’s cosmopolitan capital is home to an immense and tangible history. Uncover the eventful past of the Tower of London, or visit the magnificent Westminster Abbey, where monarchs are crowned and some famous names like Charles Dickens, Isaac Newton and Charles Darwin rest in peace. London offers countless things for you to see and do after your English lessons. Watch the Changing of the Guard at Buckingham Palace; shop at bohemian markets in Camden and Notting Hill; or tour superb museums and art galleries a stones-throw away from the school. Amidst all the hustle and bustle of London, you’ll find peaceful oases like Hyde Park and Regent’s Park. Opposite Regent’s Park and London Zoo lies Primrose Hill, from which you can enjoy stunning panoramas of the city. Alternatively, ride the London Eye, Europe’s tallest ferris wheel. Right beside the River Thames, it gives you unrivalled views from the very heart of the city. Mainly based in Kensington, this English language school in London runs English courses across four locations, all in affluent areas within central London, close to all the main tourist attractions. The two main school buildings are in the Kensington area near the Gloucester Road tube station in Zone 1, which is a superb location for soaking up some culture whilst you study English. Just minutes away are some of England’s best museums, including the Natural History Museum, the Science Museum and the Victoria and Albert Museum as well as many pubs and shops. Kensington Palace, with its verdant gardens, is also very close by. The largest building used by our school is in London Kensington and has 22 group classrooms with interactive whiteboards, together with an additional eight classrooms for Private Lessons. There is a main reception area where students study and have access to the school’s computers, reference books and DVDs, as well as various lounge areas and a coffee bar to get drinks and snacks between classes. An annex nearby this school building also has 12-18 classrooms. Students with different levels of English are spread across these two main buildings. Wi-Fi is free throughout. Occasionally when at full capacity, younger students and specialist English exam students study at another building located in Belgravia, which is just one stop away (about 5 minutes by underground). There is a wide range of excellent English courses available at our London Kensington school, available at every level, so you’re sure to find one to suit your needs. The Intensive course covers all aspects of the English language: speaking, listening, reading, writing and grammar. Consisting of 20 classes per week, it will improve your overall level of English. This course can be taken in the morning from 9am-1pm or in the afternoon from 1pm-5pm, so you can choose when you have your free time! If you require a little more emphasis on the spoken form of English, take the Super-Intensive course (25/30 lessons per week). In addition to the intensive course, there is an additional topic session which focuses on practising your new found language skils! Topics will typically focus on daily life, news and events, social media, hobbies and interests, together with plenty of other conversational topics! This course usually runs Monday-Friday from 9am-3pm. An Evening Course is also available, running from 18:30 to 20:30 on Mondays, Tuesdays and Thursdays for 1-24 weeks. This programme is particularly useful if you work in London during the day. It can help you with your overall understanding of English so you can use it more confidently in everyday situations. Each session lasts 50 minutes and is followed by a 10-minute break. The general Business English course is very useful for people who need English for their work and career and can be taken with either 20, 25 or 30 lessons per week. This course gives students business English practice and helps them create their own professional CV, write formal emails, participate in meetings and conferences, write promotional materials and give presentations. You will also learn and improve on your business vocabulary. For a smaller group setting and more focus on English in the workplace ask about our Mini-Group business course, with a maximum of 8 students in class. One of the particular highlights of this school is their Family Course which is suitable for children aged 8-16 years old and their parents who wish to study simultaneously. This course takes place on specific dates in spring, summer, autumn and winter. In Spring, Autumn and Winter, parents and children are both in the Kensington buildings. In the summer, children study in the Belgravia building (near Victoria station) while parents study at the Kensington building (5 minutes away on the underground). Juniors focus on spoken English and learn with activities, group project work and trips around London, as well as classroom based learning. Parents focus on concentrated practice of their spoken English. For complete flexibility and the best tuition possible, opt for a course of 30 or 40 Private English Lessons. Not only will you decide when the lessons take place, but you’ll also have total control over the subjects you study. Benefiting from the undivided attention of your teacher, you’ll learn English in no time! Thinking about taking a long-term English course in London? You could make a great saving with one of our school’s Academic Year courses! Reduced-price lessons run for 25, 28, 36, 42 or 48 weeks (including holidays), giving you the chance to really experience England and its culture! A great way to discover the local way of life is by working in an English company. Our school can organise an unpaid Work Experience placement to supplement your English lessons. Internships are available in fields such as tourism, fashion, administration, engineering and computing, depending upon your experience, qualifications and language skills. Working in an English-speaking environment, using the language in everyday situations, you’ll quickly improve your English! Students should be prepared to stay for 3-6 months for this programme. Other courses offered by our school include the Christmas Course, Teen Course and other various study options. 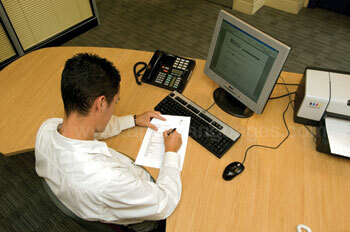 Exam Preparation courses are also available, readying you for the Cambridge Exam, the IELTS exam or the TOEFL exam. For any further details on our English courses, or questions you may have about any of our English schools in London, please contact us. There’s no better way to learn English in London than by staying with a local family of native English speakers. You’ll constantly use and build upon your language skills, particularly at mealtimes, when you can chat to your family over home cooked meals. Choose a bed & breakfast arrangement, half board accommodation (breakfast and dinner each day), or a daily breakfast plus three or four dinners a week. 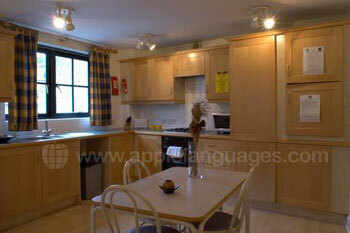 Alternatively, you can prepare your own meals in your host family’s kitchen. Host-families in London are located throughout Zones 1-5 all in pleasant areas of the city. 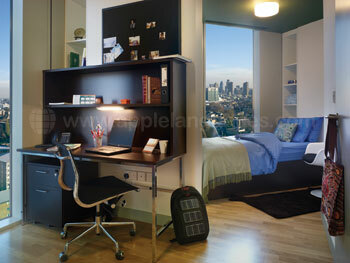 Some students prefer to stay in Zone 2 in Premium homestays in order to be right near the centre of the city. They also to have the option of adding a private bathroom. Standard host-families are located in Zones 3,4 and 5, but many are in zone 3 which offers no more than 45-minutes commute time, which is good for London! Longer-term students may prefer a host-family located in Zone 4 or 5. 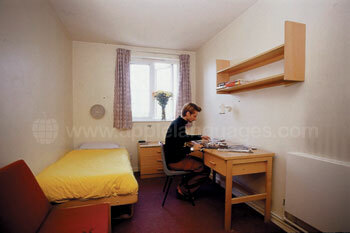 For a little more independence, choose to live in one of our school’s residences, all located in central London. Some residences include meals, whilst others have self-catering facilities. 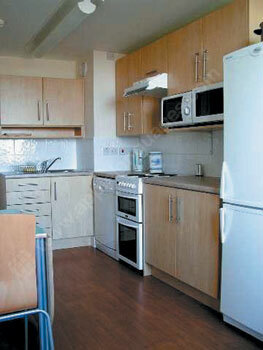 Residence accommodation is available for all budgets, with more residences open during the summer. Most of the residences are not exclusively owned by the school, but are rented by other university and college students studying in the Capital. The lovely and modern Hammersmith residence is located about 20 minutes from the school (10 minutes on the underground) and is built on the site of the famous Hammersmith Palais entertainment venue. The entrance to this accommodation opens onto a spacious 24 hr reception/lounge area with a grand piano and communal Apple computers. The rooms are spacious individual studios all with a private bathroom and kitchenette (including a two ring hob, a kitchenware/utensils pack, a microwave oven, fridge) as well as a desk and luxurious underfloor heating! 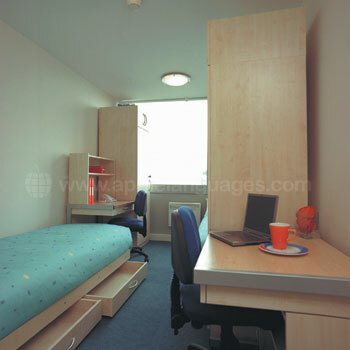 This residence also boasts a silent study room, cinema room, laundrette, sports room (for dance/yoga classes), book corner, lounge with flat screen TV’s and table football, an outdoor courtyard fit for summer barbecues and activities that encourages students to meet and socialise with one other. 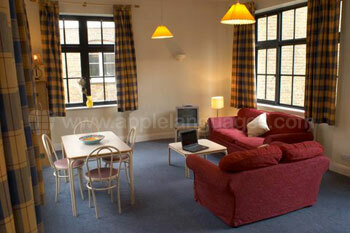 The residence is right in the heart of Hammersmith and is therefore within easy reach of shops, bars and restaurants. The Chelsea residence is located just 20 minutes’ walk away from the school in Kensington (or about 15 minutes on the bus) and offers twin or individual studio rooms. 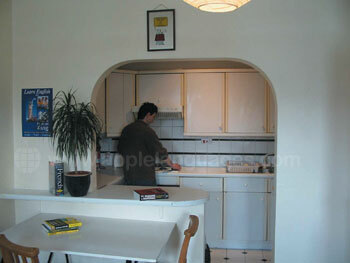 Each studio has a private bathroom and each floor boasts communal kitchens (3 or 4 people per kitchen). There are communal lounges throughout the building to encourage students to socialise as well as a coin-operated launderette. Of course there is also Wi-Fi throughout both residences. Sharing an apartment is a great way to meet other people! We have shared apartments available around Zones 1 and 2 for 1-4 people. You’ll have a fully-equipped kitchen, communal bathroom and a TV. 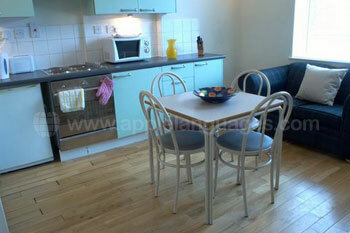 All apartments are located a maximum of 30 minutes away from the school by London Underground. 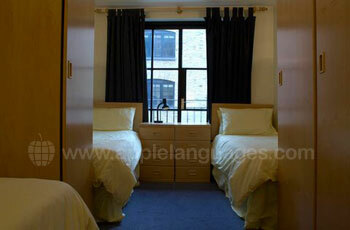 If you’d prefer your own space in London, choose one of our school’s comfortable studio apartments. You’ll have your own bathroom and, if you like, your own kitchen. Most studio apartments are within walking distance of our Kensington centres, with other centres just 20 minutes away via the Underground. Treat yourself to a stay in a stylish hotel! Our school has chosen several 3 and 4-star hotels, all conveniently located for our different school buildings. All hotel rooms have an en-suite bathroom, telephone, tea and coffee making facilities, satellite or cable TV and an Internet connection. Breakfast is included. 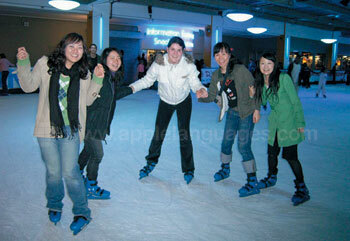 Our school organises a varied program of activities to complement your English course in London. The program changes from month to month, introducing you to English culture, showing you the sights and giving you the chance to practice your vocabulary out of class. Typical afternoon activities include guided walks around London, trips to museums and art galleries such as the Natural History Museum and the Tate modern, tours of the BBC Television Centre and The Houses of Parliament, football matches, Live Jazz events, visiting different areas of London such as Brixton village and Soho and boat trips along the River Thames. You can even go on a Harry Potter walk! In the evening, you could be learning to dance the Salsa, dining out with classmates, watching English language movies or enjoying a drink in a traditional English pub. 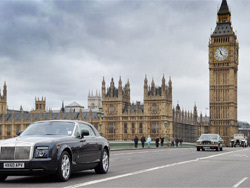 At the weekends, you can join excursions to some of England’s most popular attractions. Marvel at prehistoric Stonehenge, visit spectacular Warwick Castle, or experience the charming seaside town of Brighton! The school organises these tours with fantastic discounts! Transfers from a number of London airports and train stations are available upon request, although they are not included in the cost of your course. Central London is easily accessible by rail, bus or underground - the school can be easily reached directly from Heathrow airport on the Piccadilly underground line. Average score for our school in London (Kensington) based on 7 previous client reviews.